Swedish - French artist duo Anna Hellsgård & Christian “Meeloo”, now based in Berlin, have been working together since 2001, creating and producing prints, artist’s books, sculptures, zines and more in their print studio Re:Surgo!, cementing their reputation as master silk screeners and innovators of the medium with every new project. Gfeller’s incessant artistic output began in 1995, when he started making zines under the name Bongoût. From day one of their collaboration, Hellsgård and Gfeller have placed as strong an emphasis on intuition and skill on DIY ethics and communal practice, in frequent collaborations with other artists on print projects, organising exhibitions, and opening their independent artist space and retail store in Berlin to international artists and musicians. They are perfectionists in terms of technique, and their sought-after limited-edition prints are meticulously produced from start to finish. Thought the years, their desire to never repeat themselves and to pursue formal innovation and challenging visual content has animated every project and inspired further experiments. In their quest to constantly test and push the boundaries of the medium, they have begun to deconstruct its conventions, techniques and formal structures. Their series of monoprints “Bad Printing” illustrated this intention to question the familiarity of the silk-screening process as it consciously highlights _ and celebrates _ its idiosyncrasies. Across the intentional overlaps, smudges, bleeding, glitches and transparencies we can recognise, in the two dimensions, a temporary axis as well, a decidedly analogue visual chronology of becoming. As such, each unique print is conceived like an experimental painting, in which accidents and errors play an important part. This resonates with one of their favorites, German painter Georg Baselitz, who described his approach as a struggle, a taming, a negotiation with the image in becoming: “ I begin with an idea, but as I work, the picture takes over. Then there is the struggle between the idea I preconceived …. and the picture that fights for its own life. “ Experimentation can never be about control. For Hellsgård and Gfeller, it is also importantly, about un-learning. Chance is given a new prominence in the “Bad Painting” series. Using investigations into different intensities of abstraction and aleatory geometry, more intuitive than mathematical, these prints create an evocative fractal landscape of shapes, colours and depth. With their series of unique books, such as The Idiot, The Stranger and The Prince, Hellsgård and Gfeller have also rethought the format of the book. Each of the book in this series is titled after a canonic literary work and its solemn cover and precious binding, like an original manuscript, prompts us to rethink the understanding of what as book is, how it circulates as a material object and how it mediates its content. Each page is a unique print, and on each the pictorial references and figurative elements disintegrate and realign into an abstract composition across the multiple planes and images. Echoing its literary namesake, a dense visual narrative emerges across the pages of each book. tape to produce a noisy mishmash of pattern and color. Wand and Mauer are both German words for “wall,” but they connote very different things. The former refers to an interior building wall—the wall of a room; the latter specifies something heavier and fortified—most famously, the Berliner Mauer that divided West Berlin from East Germany. The two nouns suggest the distinctly different purposes that can be served by the same simple structure. Walls define spaces and communities; that which protects and insulates can also divide and alienate. behemoth structures, but as one squeezed past them, their physical authority became more dubious, the shoddiness of their materials more visible. The perfection of the white cube gallery served to emphasize the gritty imperfections of the rough wood; there was none of screen-print’s habitual slickness; the passage of a squeegee only accentuated the substrate’s flaws. Up-close viewing revealed endless accidental beauty and surprises. residency took place just before the election, and the subject came up regularly among the artists and their volunteer assistants. Coming from Berlin, a city ruptured by a wall, to Texas, a border state in the midst of national debate about wall-building, Gfeller and Hellsgård were drawn to the subject in all its ambiguity. In Germany too elections are looming and city streets are lined with political billboards—signage that was a further inspiration to the artists. To pedestrians, these freestanding walls with rear support anchoring them to the ground are both obstacles and advertisements. “Die Wand / Die Mauer” raised all these issues without descending into polemic. "Christian Gfeller and Anna Hellsgård: Die Wand / Die Mauer"
Christian Gfeller & Anna Hellsgard, Die Wand/Die Mauer(2016), screenprint on plywood, each approximately 8 x 12 x 3 feet. Unique objects. Printed by the artists. Published by UT Guest Artist in Print Program, Austin. In “Die Wand / Die Mauer,” Christian Gfeller and Anna Hellsgård used freestanding, screenprinted billboards to slice up the Fieldwork project space inside the University of Texas at Austin Visual Arts Center. Three eight-foot-tall, twelve-foot-wide walls were arranged in parallel, cutting diagonally through the room, towering over visitors and obscuring the view of the space. 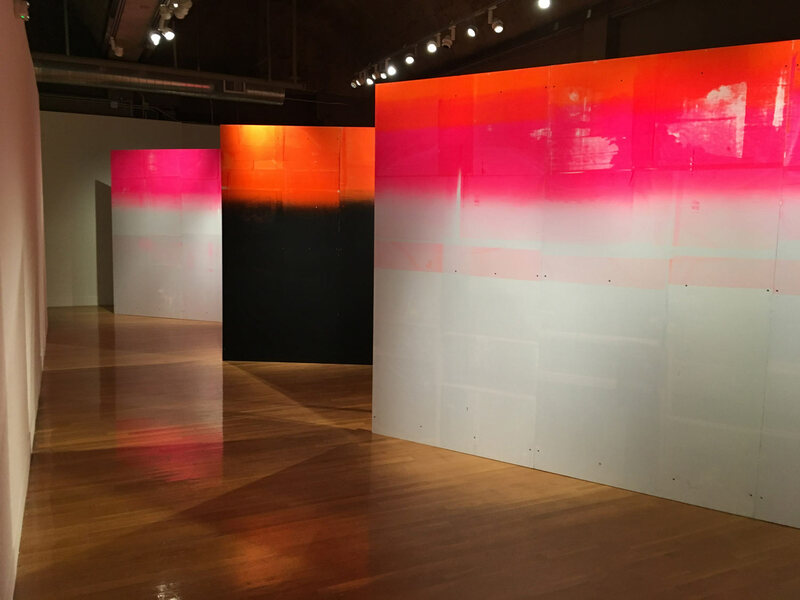 The front sides were screenprinted with gradients of fluorescent pinks and oranges, fading into neutral whites and blacks, while on the backsides the artists layered stencils haphazardly using crisscrossed masking tape to produce a noisy mishmash of pattern and color. Gfeller and Hellsgård, a Franco-Swedish duo, are the owners of Re:Surgo!, a screenprint atelier and shop in Berlin, and longtime exhibitors at the New York Art Book Fair. “Die Wand / Die Mauer” was their first large-scale, temporary installation and was executed on site over the course of two manic weeks as part of the university’s Guest Artist in Print Program. Gfeller+Hellsgård for a single mechanical printing technique: the screen-printing process. Much has been written on the subject of this technique; whether about its popularisation by American Pop artists; its employment by activists of the Popular Workshop of the École de Beaux Arts, Paris in the service of the 1968 student uprising; or again as used in the shock tactics of the provocative graphic design produced by the Bazooka group. Screen-printing has been employed for half a century to produce an array of relatively cheap images, easy to disseminate. This is doubtless one of the reasons why the duo, in its turn, having explored the medium and the figurative field of action associated with it, have used it to produce more than three hundred books and posters. It is also why they decided to shift their focus, introducing rather more formal research into their practice; combining their virtuosity with graphics with the pleasure for making, a return to process, and to a low-tech mechanised technique. Roland Barthes declared that he did not want to write novels because they favoured content, that is, narrative, forcing form into a secondary role as a mere accessory. This same spirit, led the Gfeller + Hellsgård duo to produce non-figurative screen-prints. These were works that moved away from micro-narratives, everyday anecdotes, fragments of lived experience in favour of experiences resulting from the process itself, from a reality that informs the image without ever giving it structure. Their work embraces accidents, anything that stems from any of the processes they employ or their use of materials, or from the processes described earlier in this article. Since the artists are not formalists, employing line and form to structure their work, they state, “accidents resulting from the processes used are a feature in between 20% and 80% of our work. We chose to blend colours, and with the experience we have accrued, we do have a precise idea of what the final result will be. On the other hand, neither of us can master each detail exactly. We know what colour each mark will be, its approximate form (a line, a point, a gradation, a drip, etc. ), but we do not know in advance what the precise form the mark will take ... whether it is going to measure 1.8 cms or 3.2 cms, even though we do have a complete conception of the work in general terms.” It is more a case of distributing colour, using a pouring technique, by scraping, rolling, and spreading, over a metal, paper or wooden surface to produce an informal pop abstraction, which lends enormous energy to the printed work, each with its own unique experiential field. The images produced seem inexhaustible. They have an energetic visual impact thanks to the specific relationships between warm and cold colours, mixing reds and greens, yellows and blues. Gfeller+Hellsgård prove that they are fully part of the dynamism of this story. Des actions : élaguer, mélanger, enduire, caler, décaler, verser, encrer, répartir, étaler, rincer, nettoyer, relier. Mais aussi des matériaux : de l'encre, du papier, du bois, du métal, de la laine. Voilà ce que serait une tentative de recensement des moyens utilisés par les artistes Gfeller+Hellsgård pour réaliser leurs œuvres depuis près de quinze ans dans leur espace de Berlin. Un lieu atypique et hybride qui contient une galerie où l'on a pu voir des expositions étonnantes qui naviguaient entre art contemporain et outsider art (installation, peinture, raw art, concert noise, graphzine, illustration, photo). Mais aussi une boutique où l'on trouvait une multitude d'objets, fanzines, tee-shirts et livres divers créés par des artistes avec lesquelles ils entretiennent des liens comme Pakito Bolino ou Stéphane Blanquet.Tous les éléments de ce qu'il convient d'appeler une culture graphique urbaine underground proche du commando, par essence réactive, parfois proche du freak show, tournée vers la psyché et les manifestations conscientes ou inconscientes de l'esprit humain. Enfin, et pour le principal, l'espace reste un atelier de production nécessaire à la passion qu'entretiennent Gfeller+Hellsgård pour un procédé d'impression mécanique : la technique sérigraphique. Sur celle-ci, on a beaucoup écrit. Quelle soit popularisée par les artistes du Pop américain, par les activistes de l'atelier populaire des beaux-arts de Paris au service du mouvement de 1968 ou encore par les provocations graphiques destroy du groupe Bazooka ; le procédé a fourni un demi siècle d'images peu coûteuses et aisément diffusables. C'est sans doute une des raisons pour laquelle, après avoir exploré, à leur tour, ce champ d'action figuratif à l'aide de cette technique, éditant plus de trois cents livres et affiches, le duo a décidé de se décaler, de mettre en place des recherches davantage formelles ; ajoutant à la virtuosité graphique, le plaisir de faire, de renvoyer au process, à une mécanisation low tech. Roland Barthes déclarait ne pas écrire de roman parce que celui-ci favorise le fond, c'est-à-dire le récit, et rétrograde la forme au rang d’accessoire. Ce même esprit conduit désormais le duo à créer des sérigraphies non-figuratives. Des œuvres qui écartent les micro-narrations, les anecdotes du quotidien, les fragments de vécu au profit des expériences issues du process lui-même, d'un réel qui innerve l'image sans jamais la structurer. Des accidents aussi, de tout ce qui peut découler des actions mais aussi de l'usage des matériaux et des actions énumérées plus haut dans ce texte. Car les artistes ne sont pas des formalistes qui utiliseraient la ligne et la forme pour composer les œuvres. « Les accidents du process c´est entre 20 et 80 %. On choisi les mélanges de couleurs et avec l´expérience, on a une idée précise du rendu final. En revanche, on ne maîtrise pas l´exactitude de chaque détail. On connaît la couleur de chaque tâche, sa forme approximative (une ligne, un point, un dégradé, une coulure...), mais on ne connaît pas à l'avance la forme précise de la tache... si elle va faire 1,8 cm ou 3,2 cm. Même si la composition générale est totalement maîtrisée », déclare les artistes. Ici, il s'agit davantage de distribuer, en versant, en raclant, en étalant, en répartissant, les couleurs sur la surface de métal, de papier, ou de bois dans un abstractionnisme informel pop qui fait de l’œuvre imprimée une masse d'énergie et donc un champ d'expérience unique. Les images produites semblent inépuisables. Elles ont un impact visuel énergique grâce aux rapports particuliers qu'entretiennent les couleurs chaudes avec les couleurs froides, en entremêlant les rouges et les verts, les jaunes et les bleus. Elles peuvent s'inspirer librement d' un récit mythique comme celui d'Alice au pays des merveilles ou bien venir d'une libre inspiration et contenir dans un espace all over : triangle, rectangle, carré, tache, ligne et champ coloré qui se succèdent, se croisent ou se superposent . A un moment où une nouvelle génération d'artistes utilisent l'image mécanique de Wade Guyton à Antoine Donzeaud, de Nathan Hylden à Renaud Regnery, Gfeller+Hellsgård prouvent qu'ils appartiennent à part entière à la dynamique de cette histoire. The language faculty is the ability to create to the infinite, phrases and thoughts from of a small number of elements. More generally, the language is a communication system. Gfeller+Hellsgård' s language founds it's semantic basis in the silkscreen printing process. The duo commits to rethink, deconstruct and reconstruct the medium through experimentations. Its syntax is slowly changing, it branches out and becomes more complex by incorporating other languages ​​such as painting, obviously, but also binding, DIY or poetry. Like any language, it is inherently arbitrary and to survive must go beyond its own borders. This graphic and plastic cryptolect that practices Gfeller+Hellsgård plants it's roots in a trans-national environment of highly urban density, Berlin in this case. It is a contemporary living language, that feeds on minimalism, abstractionism and underground culture. La faculté du langage est la capacité de créer à l'infini des phrases et des pensées à partir d´un petit nombre d'éléments. Plus globalement, le langage est un système de communication. Le langage, chez Gfeller+Hellsgård, a pour base sémantique le procédé d'impression sérigraphie. Ce médium que le duo s´applique à repenser, se construit et déconstruit au gré des expérimentations. Sa syntaxe se transforme lentement, elle se ramifie et se complexifie en intégrant des signes issue d´autres idiomes tels que la peinture, en toute évidence, mais aussi la reliure, le bricolage ou la poésie. Comme tout langage, il est fondamentalement arbitraire et pour survivre se doit de dépasser ses propres frontières. Le cryptolecte graphique et plastique que pratiquent Gfeller+Hellsgård plante ses racines dans un environnement trans-national et à forte densité urbaine, Berlin en l'occurrence. C'est une langue vivante, contemporaine, qui se nourrit de minimalisme, d'abstractionisme et de culture underground.